Android Wear is getting a major update in the coming weeks which will include its first watch-to-watch communication service, as well as the ability to tap to interact with watch faces. According to information gained by Phandroid, the update was ready to be revealed on July 28 but that has now been pushed back until some point in August. Luckily the site has revealed all the features included. The new communication feature is called Together and works in a similar way to the Apple Watch's drawing function, and will allow you to send messages, emojis, photos, stickers and doodles to your friends. The code suggests it'll only work on one watch face meaning you and your friend will both need that same design in order to receive messages, however it's possible Google has changed this since the information was nabbed. Google is also introducing a new gesture to Android Wear: the single tap. At the moment Google lets you swipe up for notifications, swipe down for quick settings, long press to open the watch face selector and swipe left to open the launcher. The single tap feature will be customisable with four different options. One will be a tap to cycle through details such as the weather whilst another will reveal information directly from the watch such as fitness details. There's also the option to introduce visual changes such as changing colour, or it can be used to open up a new activity - but it seems the activity will be specific to the individual watch face. 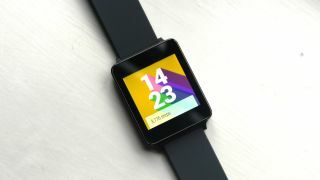 The leak also suggests the LG G Watch R is soon to have its Wi-Fi capabilities turned on for the first time. We knew it was coming after a statement from LG but it's been a long wait to get it. As for the official news of the update we'll have to wait until at least August, but hopefully once it's announced it won't be a long wait.